Welcome to my stop on the Complete Guide to Pet Health, Behavior, and Happiness blog tour sponsored by TLC Book Tours! Thanks to TLC for the invitation! When I was approached about reviewing this book, I had recently adopted three cats; one adult and two kittens. I already knew I love National Geographic books for their comprehensiveness and beautiful photographs. It was a win-win! 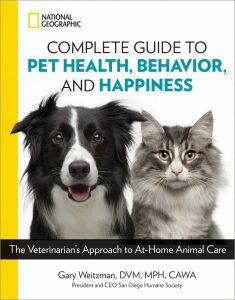 Complete Guide to Pet Health, Behavior, and Happiness is replete with a veterinarian’s advice on health, behavior, and training for cats, dogs, and other domestic animals. This book is a wonderful reference to have on hand when you have a concern. Dr. Gary Weizmann, DVM, writes in an approachable and easy-to-read style. I LOVE that he is the president of the San Diego Humane Society (we adopted our cats from our local humane society). My favorite aspects of the book are the tips about when to take your pet to the vet. I tend to err on the side of worry, and I have been known to needlessly take my cats to the vet. Who wants to do that? The cats definitely don’t want to go! 😂 I’m grateful to have some advice on where to draw the line. I also appreciated the dietary tips and behavioral information (there is tons of help and understanding here!). All in all, this is a sound and helpful resource for any pet owner to have on hand. This sounds good. I have cats, dogs and guinea pigs, so I think I might read this! I hope you get a chance to, Emma! It’s a great resource! P.s. I love that you are an animal lover too! I have to try this one. Looks just like Cynder on the cover along with Harper! 😍 Great review, Jen! Thank you for sharing this. Thanks, favorite M! I thought that dog looked familiar too- now I know – it’s beautiful Cynder! This is a really nice book to have around. Looks like a great book to have on hand for any pet owner. I think so, Marialyce. A solid resource for reference. This looks like a great resource for pet owners😁 I love National Geographic books as well! I think so, too, Tammy! I’m glad you are a fan also! This is the book I wish I’d had when I got my pooch. Casey’s long gone but I made so many mistakes. Thanks for featuring, Jennifer! It sounds like it. I Google stuff about my dog all the time. He’s going to be 11 in June and has so many problems right now that I feel like we are at the vet a lot or she’s here (she’s fab and makes house calls). Still, it can be a lot and you just need to know when it’s an ER-like when you have kids! You don’t take them for everything, or I don’t. I do-well, not as many as I used to! One time we had 5 cats, 2 dogs, a bunny, 2 hamsters, and some fish! Chaos! This sounds like such a useful and reassuring book, I’m glad you’re finding it helpful. Sounds like a must have for pet owners! I so agree about them not wanting to go to the vet – trying to get Tuppence in the carrier is like a horror movie, and quite often just as gory! I often have to restrain myself from rushing there if one of them is a bit off. I try to remind myself that I don’t go to the doctor every time I cough! This sounds like such a good resource to give someone who gets a new pet! Like a “welcome to pet parenthood” gift! Thanks for being on t his tour! That is a great idea, Sara! I love that! It’s my pleasure! Thank you for stopping by! I love Nat Geo & I’m really hoping to adopt a dog this summer (*fingers crossed*) so this could be a helpful resource when the time comes! Oh, I love that news! I have my fingers crossed for you!